Someone I fear forgot to tell several of the New York Ranger and New York Islander prospects that there are only 17 days left in the regular season for the juniors and the NCAA. There was a missing sense of urgency in several of the games as teams hurt themselves by their efforts. 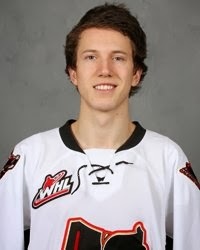 What a scary thought it would be for teams in the WHL's Eastern Conference as what kind of season would Adam Tambellini (NYR 2013 3rd) had if he had began the season with the Calgary Hitmen? The game's 2nd star Tambellini had a goal and an assist to help his Hitmen to a 5-1 win over the Kamloops Blazers. Tambellini got the Hitmen going when he scored his 16th goal of the season just 31 seconds into the 2nd period. Tambellini has put up points in 9 out of his last 11 games going 12-6-18 and he is a very good reason why Calgary is unbeaten in their last 11 games. Kamloops would tie the game but Tambellini would earn the primary assist on the goal that gave the Hitmen the lead for good. With Calgary on the power play, Tambellini set up Brady Brassart at 14:25 and Calgary never trailed after that as they would finish Kamloops with 3 goals in the 3rd period. To say Tambellini is hot would be an understatement as those 18 points in 11 games gives Tambellini a 16-15-31 mark in 23 games. If Tambellini had started the season in Calgary then he would be like Anthony Duclair with a 50 goal/100 point season. Tambellini has proven himself to be a valuable addition for Calgary and they will need him as they start a 5 game road trip on Saturday with an afternoon matchup with Edmonton. The winner will have 1st place in the WHL's Eastern Conference with 7 games remaining until the playoffs. Kyle Burroughs (NYI 2013 7th) and his Regina Pats got back on the winning track with a 4-3 overtime win over the Swift Current Broncos. This was a big one for Regina as they moved 7 points ahead of Swift Current for the WHL's East Division crown and the 2nd seed in the WHL's Eastern Conference that goes with it. Burroughs was scoreless and a +1 for the game. Ryan Graves (NYR 2013 4th) had a secondary assist as his Val-d'Or Foreurs shutout the Gatineau Olympiques 5-0 in QMJHL play. The assist was Grave's 14th of the season which is a new career high for the 6'4 defender who is better known for his defense. Graves is now 5-14-19 which are all career highs for him but more importantly the win keeps the Foreurs within 3 points of the Telus West Division lead with 7 games left. The Foreurs are currently 5th in the QMJHL but the division crown would move them into the top 3 in the QMJHL which would guarantee the Foreurs home ice advantage going into the 2nd round. Graves was a +2 on 3 shots and 1 hit. The only team hotter than Grave's Foreurs would Loic Leduc's (NYI 2012 4th) Rimouski Oceanic as after they defeated the Rouyn-Noranda Huskies 3-1 have a 10 game winning streak. Leduc had a quiet game as his Oceanic have tightened their hold on 4th place in the QMJHL while remaining 5 points behind Telus East leaders the Baie-Comeau Drakkar. Anthony Duclair (NYR 2013 3rd) had the primary assist on his Quebec Remparts only goal of the game as the Remparts dropped a 2-1 shootout decision to the Shawinigan Cataractes. The assist gives Duclair 99 points on the season can't keep giving away points against lower ranked teams like Shawinigan. Not going to fault Duclair here as he is trying as he had a game high 9 shots of which 5 were called legit scoring chances. Duclair appears stuck on 50 goals as he has gone a season high 4 games without a goal since getting number 50. Taylor Cammarata (NYI 2013 3rd) scored his 8th goal of the season as his 2nd ranked Minnesota Golden Gophers had little trouble defeating Penn State 5-1. Cammarata scored Minnesota's 4th goal of the game while on the power play in the 2nd period as he is now 8-10-18. Teammates Brady Skjei (NYR 2012 2nd) and Jake Bischoff (NYI 2012 7th) were scoreless as Minnesota opens a 4 point lead over Wisconsin in the race for the Big Ten title. Saturday's game against Penn State will be carried by NBCSN starting at 7:07 PM EDT. Cristoval Nieves (NYR 2012 2nd) and his Michigan Wolverines are playing their way off the NCAA tournament bubble and out of the tournament picture. The Wolverines tied Ohio State 2-2 but lost the shootout round 1-0 losing out on the extra point. Nieves is the 3rd line center and he was scoreless. Defensemen Adam Pelech (NYI 2012 3rd) and Troy Donnay (NYR 2013 UFA) were both scoreless as their Erie Otters escaped the Sarnia Sting's upset attempt with a goal with just 38 seconds remaining in the 3rd period. The Otters let a 3-1 lead disappear and had to be rescued with the game winner for a 4-3 win. Erie appears to be running out of gas and they have nothing to be ashamed of as they as a team have arrived a full season ahead of schedule. Jesse Graham (NYI 2012 6th) was scoreless and a +2 as his Saginaw Spirit earned a 5-2 win over the Kitchener Rangers. The win was the 3rd straight for the Spirit who are in 6th place in the OHL's Western Conference. Victor Crus Rydberg (NYI 2013 5th) was scoreless as his Plymouth Whalers lost in the shootout 2-1 to the Barrie Colts. The Whalers are pretty much locked into the 8th seed in the OHL's Western Confernce thanks to an 8 point lead with 7 games remaining. It was goalie's night off as Mackenzie Skapski (NYR 2013 6th) of Kootenay, Stephon Williams (NYI 2013 4th) of Minnesota State and Eamon McAdam (NYI 2013 3rd) of Penn State all did not play for their teams on Friday evening.